The fine folk over at Sailor Jerry must have been in a generous mood the other week, because they sent me a bottle of their spiced rum to sample! I’ll be honest in that while I knew the Sailor Jerry name, I didn’t know much about the bloke himself or the company as it is today – so I did some homework. Basically Sailor Jerry served in the US Navy and he was one of the pioneers of tattooing in the 20th century. He had a reputation for his shrewd intellect as well as his intricate tattoo designs – the rigging on his ships was accurate down to the last sheet bend! The company came about after his death in ’73, when he instructed that his tattoo shop and all his designs were to be entrusted to his protegés – and if they didn’t want it, it was all to be burned! Since then it has slowly evolved, first with a book of his tattoo flash, and then some clothing bearing his original designs, and the rum which is made to a traditional seafaring recipe. Now I’ll be honest, I’m more than a little cynical when I hear of a story like this. Lets face it, I think we all know of a brand or two who have bought the ‘rights’ to the name of a legendary lowbrow artist and basically pimped it out to make some cash. But checking out the Sailor Jerry blog, it becomes pretty clear that they’re passionate about a bunch of different aspects of kustom kulture – tattoos (of course! ), lowbrow art, rum, and music. And not just passionate, they’re actively supporting it too, with art shows and gigs to highlight up and coming artists. They’re also an anti-sweatshop company (so their clothing is made in the States not in some exploitive Asian sweatshop) which is pretty cool too. So is the rum any good? Is the Pope a Catholic? Hell yes! The rum is influenced by Caribbean Rum, which sailors used to spice with flavours from Asia and the Far-East to make it more enjoyable to drink. The result is a rum with a fuller and more rounded flavour (just like a good woman). Personally I like my rum with Coke and Sailor Jerry is great for this, whilst my girlfriend doesn’t mind a dark and stormy – and by her feedback some Sailor Jerry, ginger beer and a slice of lime tastes pretty damn fine! The added bonus is that the bottle looks ace on the shelf! We also did some back to back testing, and can say with 100% scientific accuracy that Sailor Jerry rum tastes even better when sampled from a vintage nautical mug! Sailor Jerry also have posted up a bunch of recipes on their website which include their rum, and damn some of them sound good! The good news is when I run out (cue a Jack Sparrow moment), I can pick some up at Dan Murphys – sweet! 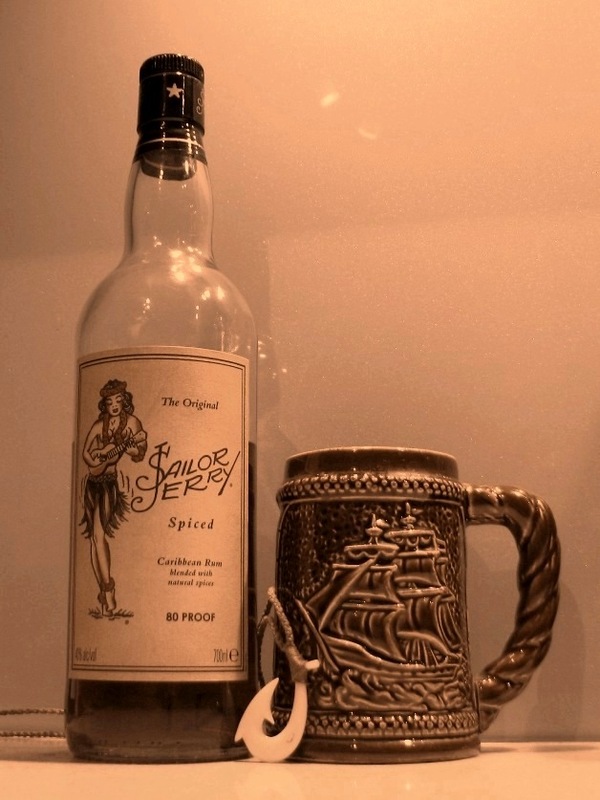 To find out more about Sailor Jerry check out their website www.sailorjerry.com or the Aussie facebook page. Thought this song might be appropriate!